If you haven’t registered a VoIP account, please click HERE to guide you for registration. We offer a variety of services for call center and discounted call service with best levels of uptime, reliability and customer service. With call center facility set up, you can process thousands of call attempts per second using a separate rate table which suits your company’s budget. Please contact us if you have inquiries, our customer representatives and engineers will be happy to assist you. After registering an account with VoIP, do inform our support team and we will optimize your account for call center traffic. How many extensions needed for your call center? Do you have internet ready? Any extra requirements for PBX (Voice Recording, Voicemail, IVR etc)? You will need to subscribe to VoIP prepaid/postpaid plans to use our VoIP services. You can do so by filling in our company’s registration form or sign up here. Minimum subscription term is 6 months. Incoming calls (via your company DID number) are free but outgoing calls will be charged accordingly where rates are subject to the country you are calling to (destination number). VoIP prepaid plans do not have subscription fees but you will need to make sure your SIP account has sufficient credit. Please contact us to request & verify your preset number display for your call center. Your call center may make unlimited outgoing calls to any desired country. How does VoIP Call Center Work? A customer makes a call using his landline or mobile phone. The call reaches your incoming line DID number which is a registered landline phone number from any country. 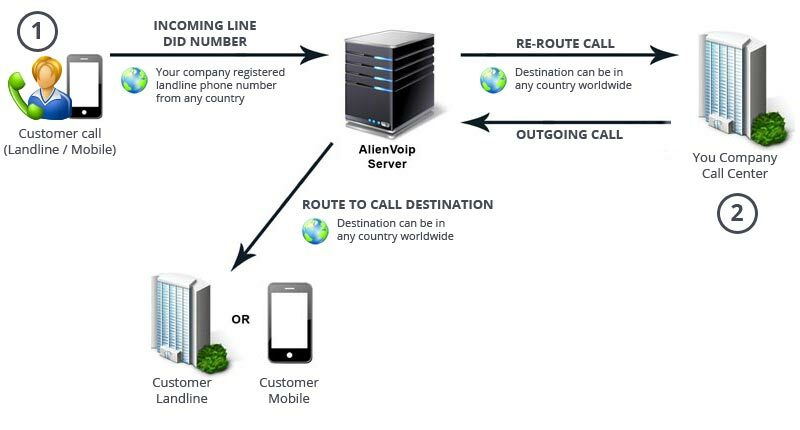 Our AlienVoIP server will re-route the call to the IP PBX in your company voip call center. The destination (your company/call center) can be in any country worldwide. When you hear the word ‘Connecting’, it indicates that you are connected to our AlienVoIP Server. When you hear the common dial tone, it indicates that you are connected to the destination number. The destination can be in any country worldwide.